Driving in France offers its challenges. The narrow passageways of ancient towns and villages that easily handled the flow of ox carts and pedestrians present obstacles for modern day modes of transportation. Sometimes traffic flows in both directions with little space separating the passing cars. 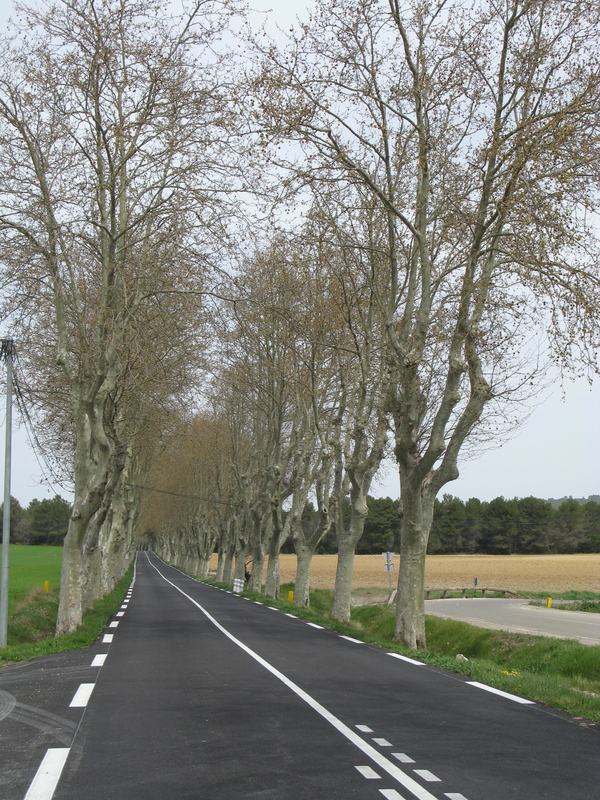 Row of platanes; typical along French national roads. And there are times when only one vehicle can pass through. Even in the more urban areas, vigilance is de rigeur. Not much space separates vehicles and pedestrians. After five weeks, I have a heightened attentiveness to my surroundings. Pedestrians have priority; motorists have to be ready to stop on a dime as pedestrians often launch themselves forward into oncoming traffic. Adding to driver anxiety are motorcyclists who unexpectedly weave in and out. Even the open road has its unique trials as shoulders are lacking on many of them. Inattention can result in a precipitous drop along winding hillside roads. A hairpin turn, and there are many, can spell disaster for the unobservant driver who unexpectedly happens upon a group of bicyclists. But these are just minor distractions obviated by the joys of driving in the captivating Provence countryside. Since my last blog entry, our wayfaring journeys through Provence have taken us to distant northern towns like Moustiers-Sainte-Marie, in the east along the Riviera to Antibes, and toward the west to Aix-en-Provence and Marseille. Along the way I’ve reveled in the luscious greens of the rolling hills, the reddish orange tinge of the rocks, the crisp blue of the Mediterranean sky, the deep aquamarine of the sea, and the rustic wooded colors of the ubiquitous vineyards spread out in the valleys or tucked away among the hillsides, lazily soaking in the sun’s rays. The olive trees too, in neat rows, parade their gradated green foliage. Everywhere the colors of spring are teeming as trees and flowers bloom. Small wonder how this land seduced artists like Cézanne and Van Gogh! Of all the places we’ve visited within the last couple of weeks, it’s hard to pinpoint a favorite. Each has its unique joy. 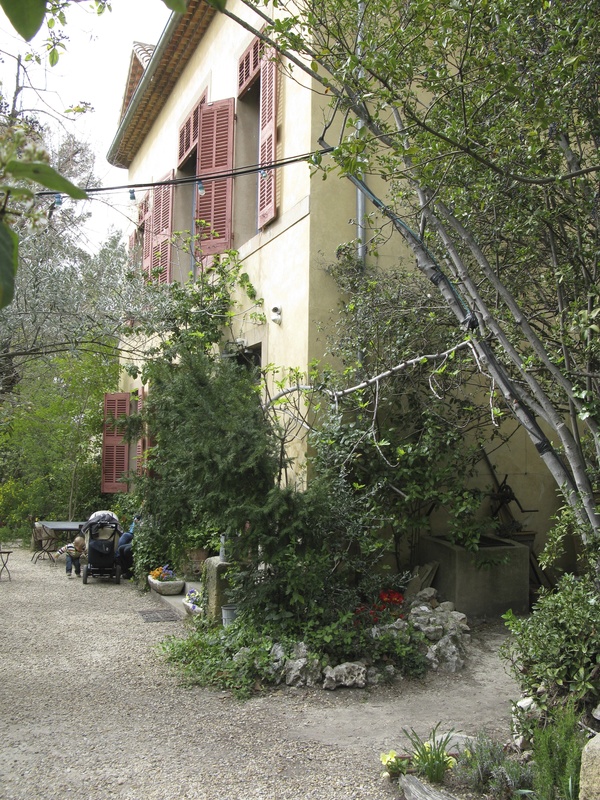 At Aix-en-Provence, we visited Cézanne’s hillside studio. As I listened to our guide give details of Cézanne’s daily routine, I imagined him painting in this squared space with large wide windows on facing walls. The windows draped with curtains permitted him to alter the incoming light from diffused to intense as he worked on his canvases. I particularly enjoyed walking around the gardens surrounding his home. 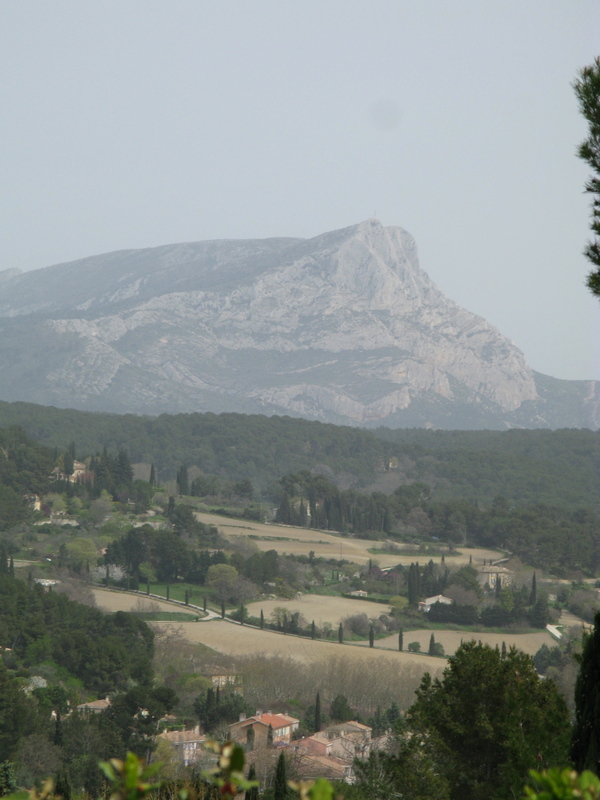 We also walked further up the hill to a favorite spot where across the valley Cézanne enjoyed a panoramic view of Mont Sainte-Victoire. That view, repeated in several of his tableaux, was instantly recognizable. Four of the nine paintings of Mont Sainte-Victoire that I am aware of are in the United States, at Princeton University, Kansas City Museum of Art, the New York Metropolitan Museum of Art and the Philadelphia Museum of Art. Although the exact location where Cézanne sat with his brushes and easel is now heavily urbanized, the valley below and Mont Sainte-Victoire remain unchanged from the way I imagined he saw them. 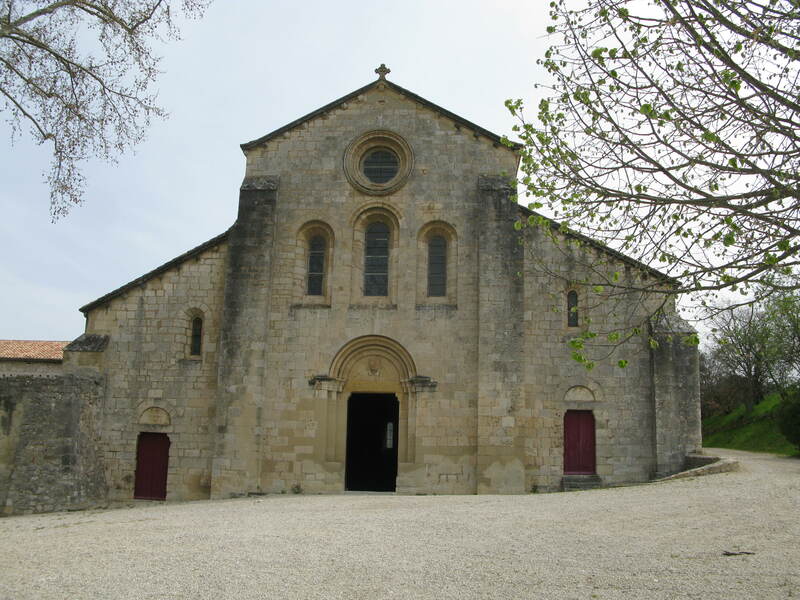 Not far from Aix was our visit to the Abbey Silvacane. Like the other two Cistercian abbeys in Provence, its graceful architecture mirrors the simplicity of the monastic life. And like the others, the acoustical sound in the chapel is impeccably crisp. During the late spring and summer months, concerts are held there regularly. We’ll keep this in mind when we schedule our next trip. Imagine IUSB’s Euclid String Quartet performing there! Another favorite trek was to Moustiers-Sainte-Marie, a Medieval village in north Provence in an area called la Verte Provence, Green Provence. Nearby is the area called the Grand Canyon of France. Situated atop a hill, as many of these Medieval villages are in Provence, Moustiers is noted for its faiencerie (ceramics). Though the day was overcast, we enjoyed walking through the tiny cobblestone streets of this isolated place. As we climbed the steps, meandering from one small street to another, we happened upon a little restaurant, tucked away from the center of town, La Grignotière. There we had a delicious lunch. Melanie ordered the plat du jour of pork filets with the most delicious ratatouille imaginable. We were among only three customers, and much to our delight, we idled the time away chatting with the cook (the proprietor) and her daughter, our server. Luckily for us, the high tourist season had not yet begun, allowing leisure time for conversation and pictures. We chatted also with the other customer, an accountant who travels occasionally to Moustiers on business. In a week of highlights, our visit to Saint-Paul-de-Vence, another perched village from the Middle Ages, was equally spectacular. 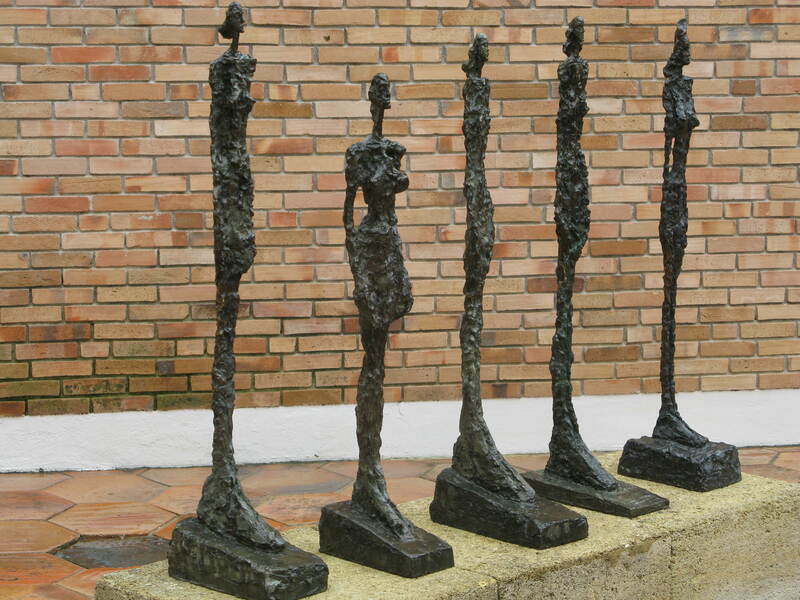 There we visited Fondation Maeght whose permanent collection of paintings and sculpture is indisputably impressive. The collection of buildings, where art and architecture come together in conversation, was designed in 1964 by Spanish architect Josep Lluis Sert in concert with other artists like Miró. The open and airy glassed-framed spaces create unimpeded distance between interior and exterior environment. Sculptures by Miró, Giacometti and Picasso grace the gardens creating a gallery of art contiguous with the art by Chagall, Léger, Braque and others in the interior spaces. 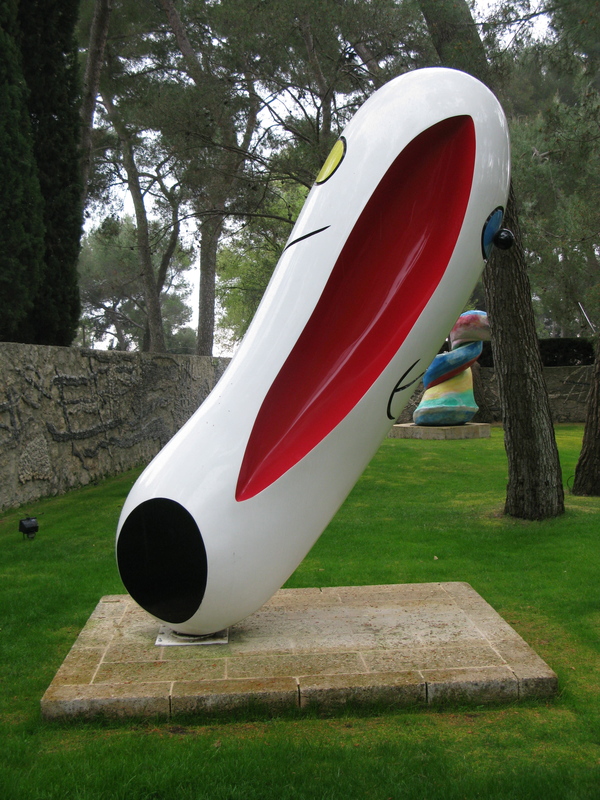 At the front entrance of the buildings a potpourri of Miró sculptures across a grassy green lawn greet the visitor. In the middle of two of the buildings sits a sculpture garden of Giacometti pieces, at the end of which lies an expansive panorama of the valley below. To the right of the Giacometti garden is a labyrinth of Miró sculptures planned by both Sert and his friend, Miró. Prior to this visit Melanie and I had never known Sert. Apparently, he is one of the major architectural giants of the twentieth-century. Many buildings in European cities bear his signature. He was also a former dean of the Harvard Graduate School of Design . Several buildings on campus bear his architectural imprint. After our visit to the Maeght Foundation, we took a stroll in the old village with its charming maze of narrow streets and alleys. For the first time, in our stay in Provence, we encountered hordes of tourists, mostly English and Italian. Saint-Paul-de-Vence is the most visited village in France. And we now know why. The village is a center of chic clothing stores and high-end art galleries. We didn’t dally long, preferring to leave the crowds, but not before walking to the end of the village where over a lovely vista sits the cemetery and Marc Chagall’s grave. From Saint-Paul-de Vence, we headed to Antibes and Juan-les-Pins to visit the Picasso museum and to say hello to the brother of one of Melanie’s former English as a Second Language students. And we celebrated my sixty-seventh birthday there. 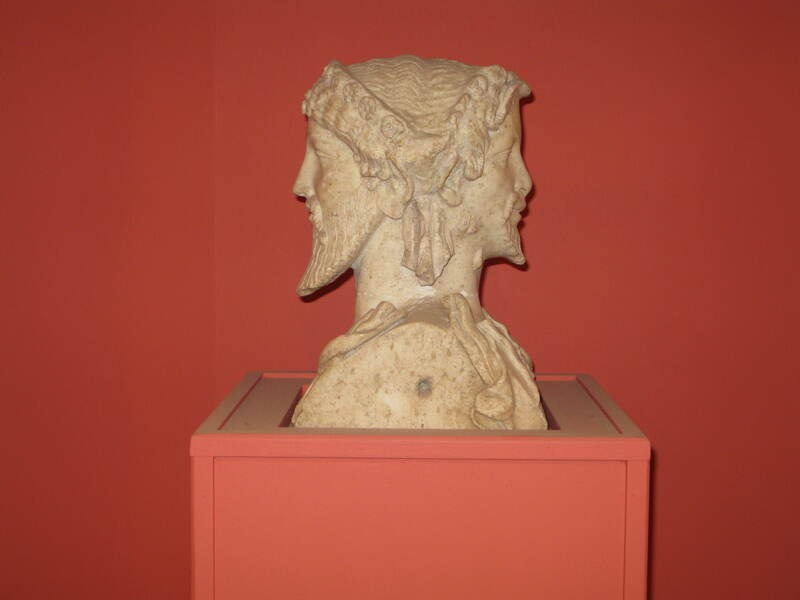 In fact, we visited two Picasso museums, one in Antibes and the other in Vallauris. In Antibes, Picasso established his studio in the Grimaldi chateau along the Mediterranean. The museum housed a number of his paintings, sculptures and painted ceramic plates. The painting that struck me most for its simplicity of line drawings, made all the more enchanting by suggestive playful movements and shades of coloring, was La Joie de vivre. The wall of painted plates of faces and linear, triangular and octagonal drawings, might have seemed bland done by an artist whose name was not Picasso. The Vallauris museum was less impressive, save for its powerful wall painting, La Guerre et la Paix in the chapel of the chateau there, and the statue, L’Homme au mouton, that Picasso made of himself and gifted to the town. In Vallauris, a town noted for its ceramics, we stumbled upon an interesting exhibit space of Jean Marais paintings and ceramics. Marais, an actor in La Belle et La Bête, starred in many Jean Cocteau films. After retiring from film and theater, he took up residence in Vallauris and learned the trade of ceramics from some of the masters. Melanie and I were quite impressed with his work. 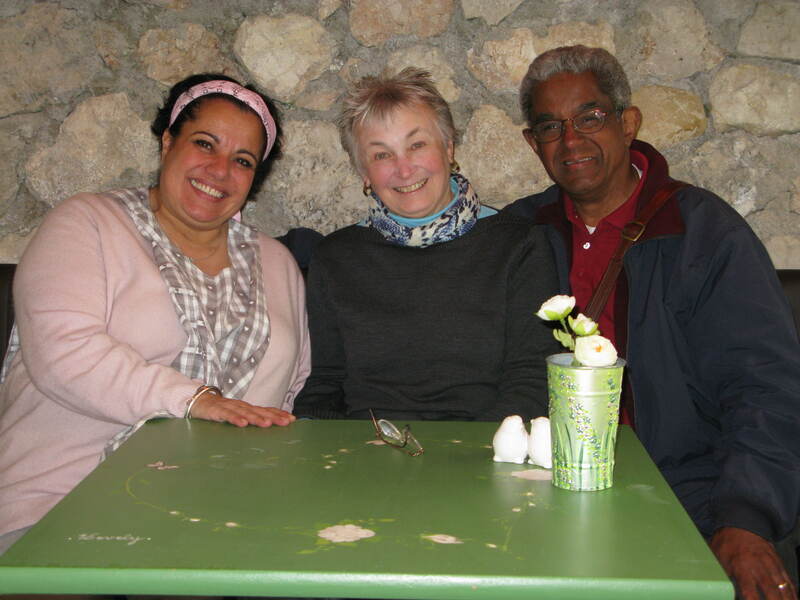 Closer to home, we visited with friends, Jacques and Daniele Martin, the Museum of European Civilizations and the Mediterranean (MUCEM) in Marseille. Opened about a year ago, the museum at the end of the Vieux Port is a catalyst for urban renewal. Indeed the site offers expansive vistas of the city and the sea, where we watched the car ferry from Algeria arrive. The MUCEM grounds are also a gathering place for visitors and local residents alike. As our friends say, the French like to denigrate the tawdriness of Marseille but take great pride in its ancient and cultural history. It’s well worth the visit to the MUCEM to explore the ancient beginnings of the civilizations along the Mediterranean. There were also two fascinating temporary exhibits, one on the Roman sculptures of Morocco and the other on Mediterranean and European carnivals. After a two-hour visit and then lunch, we walked through the immigrant quarters of town near the old port to La Charité to see an exhibit of Picasso, Warhol, and Magritte, titled Visages (Faces). Ninety artists were represented in three themes: Visages de la Société, Visages de l’intimité, and Visages de l’esprit. I’m not a fan of the modern abstract idiom, but I found myself liking several pieces, particularly by an exiled Prague artist, whose name I remember as Marie Tolen, but whom I can’t find on an internet search. Like so many in the exhibition, her pieces were melancholic and dark. But it was an excellent introduction to artists that were new to me. There were, of course, several Warhol pieces, but was deeply disappointed that there were only two canvases each by Picasso and Magritte. I’ve been to exhibits like this in the States, where the name of a famous artist is used as a ploy to attract visitors. Not long ago at Notre Dame, there was an exhibit of Mary Cassatt and her generation; a fine exhibition but, disappointingly, only one tableau of hers. It seems as if this accounting of continuous Provence travels has been a survey of art exhibitions. And indeed, the seduction of this beautiful region is its rich artistic and cultural legacy. But we’ve spent lots of time with friends here, almost always around a good meal accompanied with the requisite cheeses and wines. 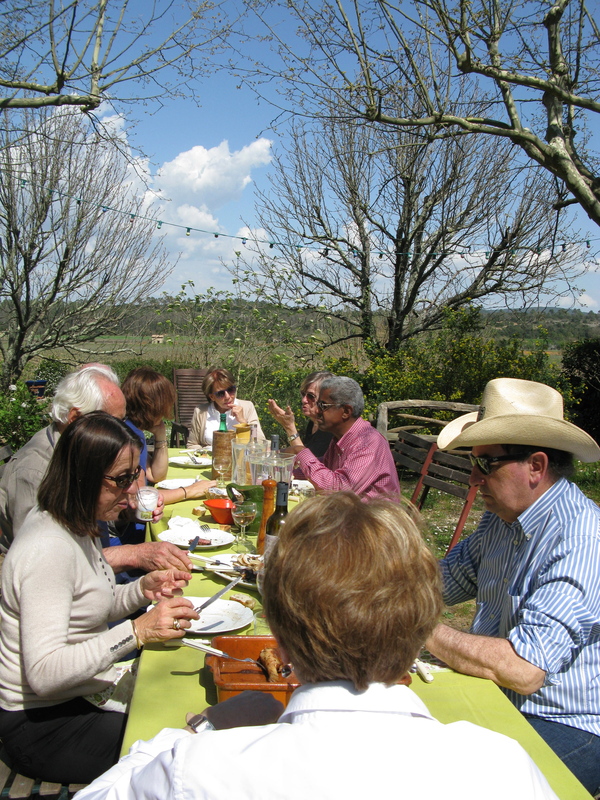 On the very first really warm day here, our friends Jean-Louis and Catherine gave us, with several of their other friends, the first barbecue of the season at his vineyard, Chateau Trians. Jean-Louis is a financier who has worked in New York, London and Paris and now Monaco. Catherine teaches Chinese in a lycée. 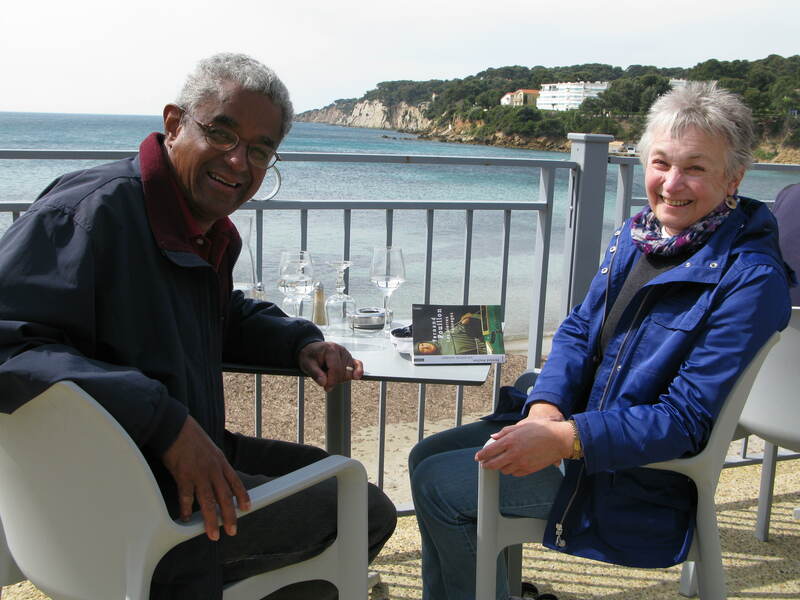 I met her a few years ago when she was teaching at the university in Toulon. One evening Melanie prepared a Moroccan fish tagine, which is becoming one of her signature dishes. It was such a hit that we’re going to have the same dish again tonight for other friends. Locally, we did a tour of an olive orchard not far from our apartment where we listened to absorbing facts about the cultivation of olives and the production of olive oil. And we spent an afternoon in the neighboring hamlet of La Garde walking through –you guessed it — the Medieval section. But the most unusual thing we did was to search for wild asparagus in the nearby woods with our friend MariThé. Later that evening, Melanie made a delicious omelet with them. Within a week, we’ll be in champagne country and Paris, and then a few days in Amsterdam before heading home. I’ll miss Provence and treasure the memories as I hold her dearly in my heart, taking comfort in knowing that I’ll travel this way again. Alfred spoke of the small streets and the tight driving conditions. But what has fascinated me is how the French have adapted to this close living. For the driving, it’s obviously smaller cars, narrower lanes and parking spaces, making narrow streets one-way or eliminating traffic altogether and creating pedestrian areas, which have the advantage of opening up a communal and festive space. In those pedestrian areas, sidewalks are used as dining rooms for restaurants, sales spaces for small stores, and places to erect a merry-go-round for children. On market day, parking lots and/or streets are closed to make space for vendors of clothing, flowers, and fruits and vegetables. Then when the market is over, a truck comes through with water hoses to clean up, and the space becomes a street or parking lot again. Multiple uses. One of the things that has really impressed me is the French ability to parallel park. You can imagine on a busy narrow street through the village, a person who cannot parallel park well. That driver would stop traffic in one direction while he/she tried multiple times to get into a tiny space. Tempers would flare. Well, over and over, we have watched as drivers make perfect 3-point maneuvers in a matter of seconds. Sometimes this also involves putting two tires up on the sidewalk. Other drivers wait patiently and then proceed quickly. Parking can really be a problem so most people walk to the market and carry their own baskets or take their rolling carts. Others walk to the stores and then take the bus home as another lady and I did week. Uphill with groceries is not a picnic. The other thing is bathrooms. Where do you put restrooms in a small building that originally didn’t have any? Once again, one learns to adapt. Many restrooms are unisex, others are separate but the hand-washing station is for both sexes outside the toilet area. A corner can be used to make a triangular area with tiny sink. Or restrooms are public in parking lots or squares. And we have been impressed at how clean the modern ones in big cities are. As I used to say to my students over and over, customs fit the culture; they are not good or bad necessarily, just different. “Ils font une fête dimanche.” Those are the words spoken by our landlady on our way to dancing rétro. It’s what they call ballroom dancing here. We had just driven past a dance club, but she decided there were not enough cars in the parking lot, a strong indication in her view that the band was not very good. But she was quick to add that there would be a big party at this place on Sunday. When asked what was the occasion, she simply responded there was none. So such is the ease of life here in Provence, along the Mediterranean. So we continued our journey across Toulon to Seyne-sur-Mer to a different ballroom with expectations that the orchestra would be a better one. And we were not disappointed. We arrived at the dance hall about 3:30 in the afternoon. The hall was packed. Obviously, this is not the working crowd; they were mostly gray-haired folk like us. There were many couples for sure, but, like our host, there were many unescorted ladies for men without partners. The music had a distinctive European flair, dominated by the accordion with fewer brass horns. The popular dances were samba, tango, rumba, rock (swing), cha-cha, Viennese waltz , Paso Doble and merengue. Popular dances also included line dances European style (la tarantella). The style of dance was different as well. Practically all the waltzes were Viennese; dancers glided across the floor in a fast-moving tempo. The quick-step was also popular, a fast-moving foxtrot. The other dances were more measured. Though line of dance was lacking; the dancers typically moved within a confined space, their dance movements more closed and controlled. Watching them dance reminded me of two of my favorite Renoir paintings, The Dance at Bougival and the Dance in the City. Melanie and I are accustomed to the Arthur Murray style of dance as taught by our dance studio, Dan O’Day, that includes larger steps that travel across the dance floor accentuated with expressive body movements and, depending on the dance, wide outstretched arms. Only one waltz (They call it le Boston) was played at the moderate tempo, and although we do not do the quick-step, we did manage a couple of foxtrots, and we squeezed in a couple of boleros, foxtrots, cha cha, rumba, and tango. All in all, we had a grand time. We’ll go back next week with our host to a different dance hall and dance the afternoon away. But dancing is certainly not the only fun activity we’ve had. We’ve been feted to wonderful evenings of dining with friends. 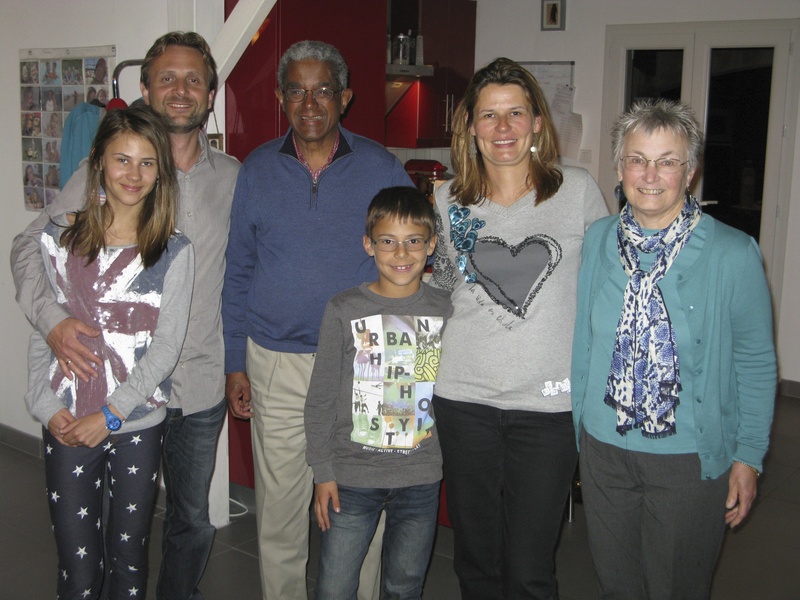 Last Saturday evening we drove with Gabriel to Brignoles for dinner at Karine Tournier-Sol’s family. Karine was the exchange professor from Toulon two years ago. The pouring rain made the drive less pleasant, particularly in the dark, among the rolling hills. Laurent and Karine’s three children, Lucie, Noé and Tom are just delightful (Tom, the youngest, is missing in the picture because he went to bed early). 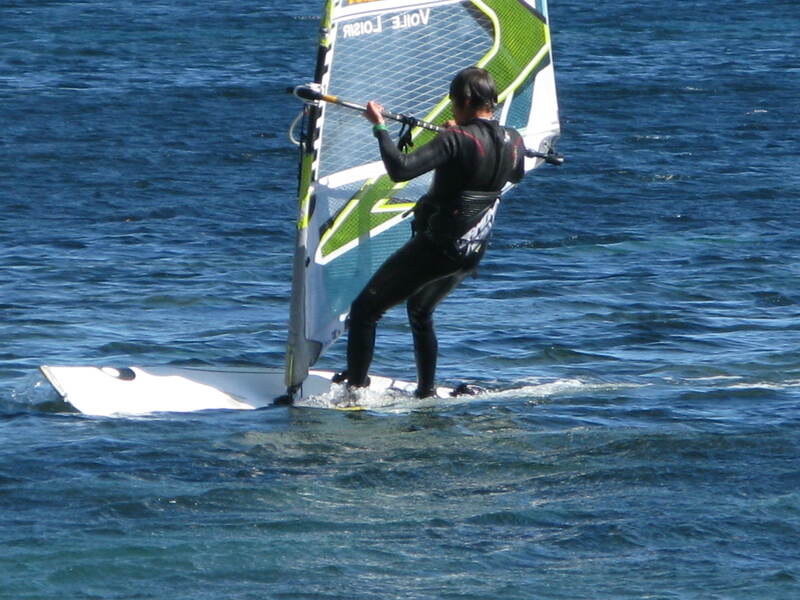 The next day, Sunday, the winds (le Mistral) were howling. But that did not prevent us from taking a walk along the coastal cliffs, which was interrupted by a posted sign advising us of soil erosion and deteriorating conditions. So we had to abandon that journey, but we’ll try again in a different location, perhaps next week. The cliff walk abandoned, we took a casual stroll along the beach where we watched a game of pétanque, a very popular game played mainly by men, similar to horseshoe, and of the young and athletic, wind surfing. Sunday was also election day. Melanie and I were amazed at the large numbers of people walking on their way to vote. We learned later that 69% of the eligible voters participated. If only we can have that caliber of interest in the United States! On Monday, we explored the neighborhood, walking downtown, visiting the small, but very nice park in the center of town. A circular small path in the park offered several exercise stations, several of which we tried. During our trek homeward, we walked through a wooded garden and followed a path up a hill that ostensibly would lead to our apartment. Unfortunately, we took a wrong turn that led us back to the main street in town. Next time, we’ll hopefully choose the right path. Tuesday, we explored an old Roman village, Fréjus, about a hour and half drive from where we live. We had a lovely day exploring the old parts of the village but were disappointed to find only vestiges of Roman ruins. On top of the old ruins of the ancient Roman theater and arena, the city had built modern steel and metal structures that were not aesthetically pleasing. However, we could take comfort that these places have been repurposed and continue to retain their original functionality. 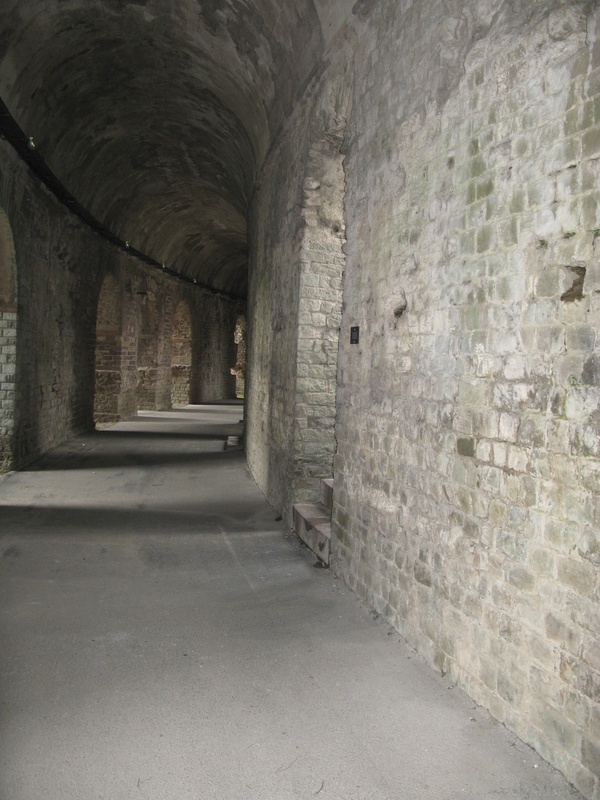 Underneath the arena, we were able to walk through the passageways where placards told the stories of Roman times. We also visited the Episcopal Group, the collection of buildings (the church, the cloister, the large baptismal fount with its Corinthian columns, the cathedral) that housed the bishop and served as the center of the diocese. Most impressive was the archeological museum attached to this conglomeration of buildings. This small space had beautiful stone and marble sculptures and a representative collection of ancient decorative and household artifacts. In Fréjus, we were surprised to see hordes of police downtown, particularly around the town hall. Our curiosity piqued, Melanie asked a vendor at a local boulangerie why. Apparently, the far right wing party, the Front National, made significant gains in the elections and the police were preparing for any troubles that might ensue. Though we stayed the majority of the day, things remained calm; there were no demonstrations, at least from what we could tell. Here in Le Pradet, in the mayor’s race, the right won, displacing the current mayor, much to the chagrin of our landlady whose political persuasion is on the left. As she related to us, the right is not good, but the far right is worse (in her words, pire). Wednesday, we lunched with a friend at her home. Marie-Hélène is the former university librarian who came to IUSB in 2000 as a Fulbright Scholar. Also invited was the current head of the library, a delightful and charming guy. In my academic career, I’ve never met a head librarian with whom I haven’t good relations. Generally, I find that librarians have a genuine openness to others and a friendly demeanor; and, they are fascinating people with inquiring minds. In the afternoon, we toured the Asiatic Museum here in Toulon. For a small museum, it had an impressive collection of Asiatic art and artifacts dating centuries before Christ up to the late nineteenth-century. We thought the Chinese collection of jade and ivory artifacts was the most impressive. It was a wonderful way to cap off a lazy afternoon. Thursday’s activities are captured in the opening paragraphs. Friday we spent a lovely evening with Jacques and Daniele Martin dining on Coquilles St. Jacques (scallops) on a bed of creamed leeks, ratatouille and lamb chops, followed by the requisite cheese plate. Dessert was a delicious serving of vanilla ice cream topped with grillotines, a small tart cherry in liqueur. We arrived at 7:30 and didn’t finish our meal until 11:45pm. But no complaints here, a sumptuous meal and great conversation aided by exquisite regional wines and tasty cheeses made a perfect evening à la française. To cap off the week’s events, we spent the afternoon at La Sanary-sur-Mer beginning with lunch at Le Bar d’ô overlooking the Mediterranean. Melanie and I both ordered salmon dishes but prepared differently. 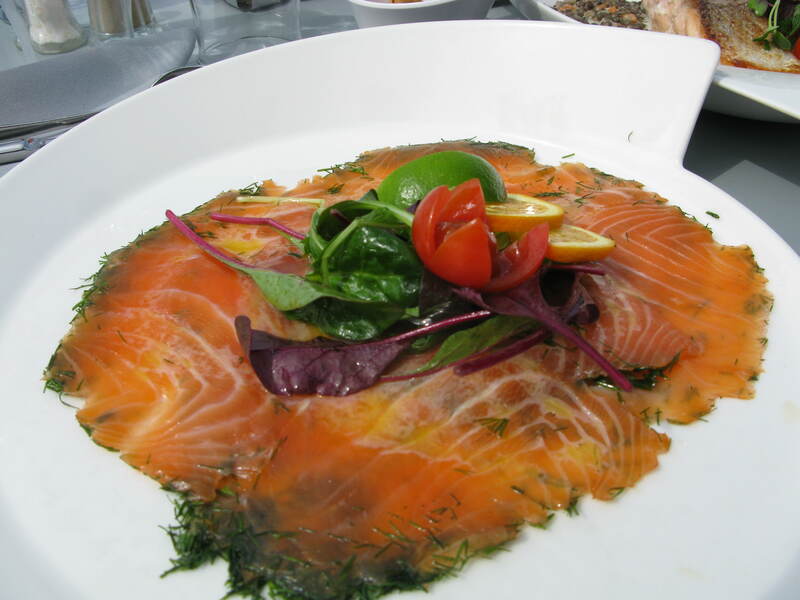 She had salmon prepared on a plank over a hearty serving of lentils, and I, marinated smoked salmon with fennel. Sitting on the sunny terrace with beautiful Provençal homes on one side of us and the expansive blue horizon of the sky and the sea with the wind slightly blowing were moments of unparalleled spiritual peace. I feel so fortunate to be here, but more on that in a later blog. Time is passing so fast I’m wondering if we should have scheduled three months instead of two. I say to our friends here that we’re fast becoming Provençal. The weather here has been ideal – moderately warm days and cool nights, so unlike the cold weather and snow that continue to assault northern Indiana. Perhaps spring will arrive by the time we return to Granger. This is Melanie in italics again. I wanted to add a few things. 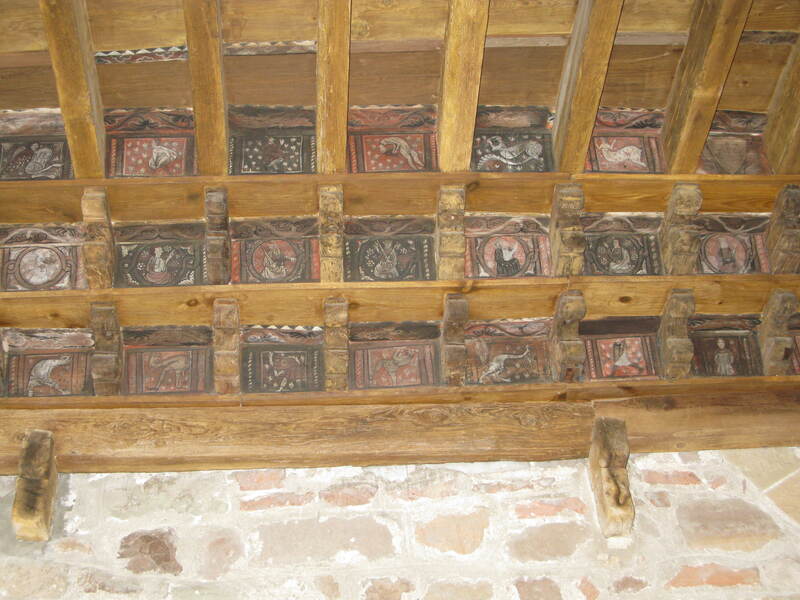 In the cloister in Fréjus, there was a wooden ceiling, which we had never seen before and along the top of the wall there were dozens of plaques of wood that had been painted with scenes of daily life from the 12th century — scenes of devils, animals real and imaginary, a woman washing her hair, people working. Beautiful colors were illustrated in a video, though of course, they had faded on the real plaques. A really unique artistic look at that time. We’re really impressed with the parks here. The one in downtown Le Pradet, in addition to having the exercise course, also has a huge aviary where there are all colors of parakeets and related species and a large gazebo where we speculate that marriages are held in good weather. (Many people here get married twice — once in the church and the obligatory civil ceremony at the Mairie afterwards on the same day.) There is also the ubiquitous monument to the citizens who died in the “Grande Guerre” 1914 . Even in little towns the list is long. But here in Le Pradet there was also a list of sailors who died in the Second World War. As we looked at the list it became apparent that all of them had died on the same day or a day after in August of 1944. This history lesson was about the “débarquement” of the Allies in Southern France. 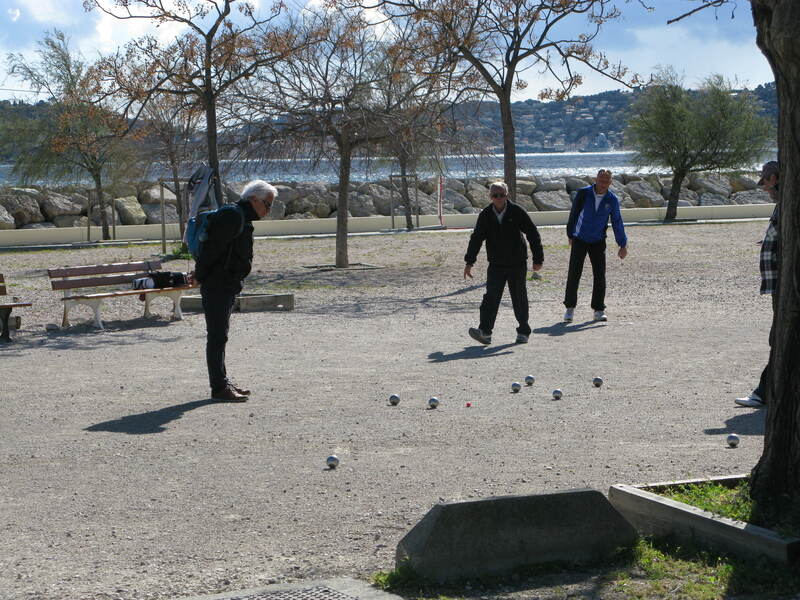 In the park on the sea coast in Toulon we saw 5 or 6 matches of pétanque, a skateboard course for kids on scooters and bikes too, two huge trampolines for little kids, basketball courts being used, the activities on the ocean that Alfred described, lots of dogs being walked, people sitting in- and outside in cafes and restaurants, soccer balls being kicked around, cyclists, families with strollers and lots of people out for a stroll. Lots of facilities for the young and old and lots of people taking advantage of them. One more comment about the Asian museum in a lovely old house on the coast which belonged to the son and grandson of Jules Verne. The city runs this museum and you can go for free. Most of the artifacts were brought back by sailors from Toulon who had been in Southeast Asia or other Asian ports. A history lesson also of the town and it’s opening to the world because of its position on the Mediterranean.